LEADING THOUGHTS Back in the day, businesses could afford to keep an arm’s length from their customers. While just about every company waxed poetic about customer support and being customer-centric, for most it was simple rhetoric, something people wanted to hear. Customer support and sales were the only departments that were really and truly touching the customer, listening and responding to the customer, whether he or she was happy or somehow unhappy about the experience. Our CEO Jon Ferrara likes to refer to this as the “castle analogy”, where companies tried to keep the customer away with castle walls, moats and artillery. Now that social media has played an equalizing role, bringing companies and customers together, the castle walls are successfully coming down. 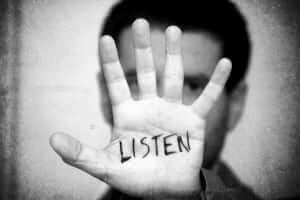 You can’t engage with anyone — a customer, or a prospect, or a partner — until you really learn how to listen. And by that, I mean really listen and really hear. When someone tells you that there’s a technical issue with your product, don’t simply shrug it off and chalk it up to user error. Make sure you 1) dig in and really understand the issue, 2) empathize with the customer, 3) establish a guideline of what to expect in terms of resolution, 4) communicate the issue back to the relevant team members and 5) keep the communication loop going back and forth. These engagement and collaboration topics are great fodder for future blog topics, as a small book can be written on each of them. However, in this post, let’s really tackle listening. When you are listening, what should you be listening for? Where should you listen? You may be comforted to know that my personal experience included working in the social media listening space, where I had a chance to learn a ton about what makes for successful listening. I learn every day, and am putting these strategies to work at Nimble. So let’s get started! Not to be wishy-washy, but this really depends; largely on where your customers are. I’d definitely start with a full brand audit, where I identify the volume of conversation that happens overall, as well as by channel. For example, you have 1,000 total mentions, and you can identify that 500 of them (50%) are on Twitter, 250 (25%) are in user forums, 100% (10%) on YouTube, and 150 (15%) on Facebook. Now you know where you should listen and focus on engaging and creating content (Twitter and user forums). You can’t possibly engage everywhere, so focus is key here — go where your customers and ecosystem of partners and thought leaders are. So you can respond to questions / requests / cires for help proactively. So you can anticipate problems before they become problems. So you can gain intelligence and understand what users like and don’t like about you. You should have alerts going about your company, brand name(s) and product name(s) across all relevant channels. You should listen to as many channels as you can, and focus on the ones you identified in step 1. In addition to listening to the obvious — product and brand names — you should also listen for names of key executives, as well as any particular initiatives / campaigns you are working on. You should also track your taglines. 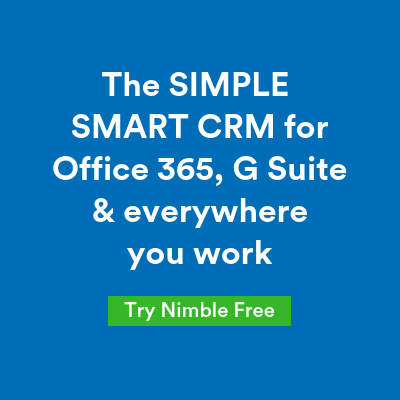 For example, here at Nimble we’d track “More customers, less work”. Moreover, if you conducted an event, you should absolutely track responses to that event. Better yet, set up a hashtag (#) upfront and ensure that everyone at the event uses it. Mentions of your competitors and industry: Similar to above, you need to know not only what your competitors are building, blogging and tweeting, but also what people are saying about them. In addition, make sure you are tracking industry keywords, so you can participate in high-level discussions, establishing a voice and forming relationships with the movers and shakers of the industry. Listening to industry keywords can also tip you off to desires, complaints, and needs of the market. You just have to learn how to listen and read between the lines. As a result, you will discover emerging trends and out-innovate your competition. Thus, if you are a web hosting company, you can listen for “looking for” and “hosting”, or “anyone know a great hosting company?” Just make sure that you aren’t automatically pushing your product at the first mention of the keyword. Instead of “hey look at my product”, I suggest you start with “I hear you are having troubles; how can I help you? Here’s a great list of troubleshooting tips.” To be effective, try helping first, before you earn the right to talk about yourself. Whatever you use to listen — hopefully it’s Nimble 🙂 — zero in on the most actionable signals and make sure you can identify the positive and the negative, as well as profile of the person tweeting. Figure out what role this person plays in the ecosystem: are they a customer, competitor’s customer, potential partner, blogger, member of the press, etc. Check out how influential they are and context for their influence. Quick caveat: digital influence can be a tricky thing as a method of prioritization, and its importance will be driven by the use case for listening. For example, when you are providing service, you need to at least attempt to service everyone without regard to digital influence. When you are developing influencer “campaigns” or any other proactive initiative, you should definitely prioritize tweets by influence of their writers. What’s next? How do you respond? How do you share this information across your team? Well, that’s fodder for several blog posts. But remember this until we meet next time… Engagement is an art and at times a practice of boundaries and restraint. Just because there’s a conversation, it doesn’t mean it’s always a conversation for you to engage in.